The DShK 1938 (ДШК, for Дегтярёва-Шпагина Крупнокалиберный, Degtyaryova-Shpagina Krupnokaliberny, 'Degtyaryov-Shpagin Large-Calibre') is a Soviet heavy machine gun firing the 12.7×108mm cartridge. The weapon was also used as a heavy infantry machine gun, in which case it was frequently deployed with a two-wheeled mounting and a single-sheet armour-plate shield. 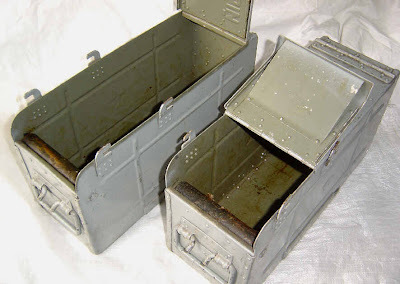 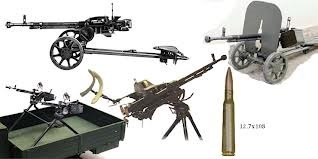 It took its name from the weapons designers Vasily Degtyaryov, who designed the original weapon, and Georgi Shpagin, who improved the cartridge feed mechanism. It is sometimes nicknamed Dushka (lit. 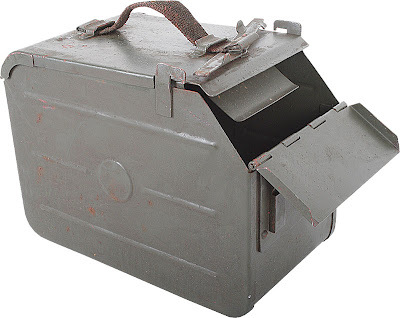 "Sweetie", "Dear"), from the abbreviation. 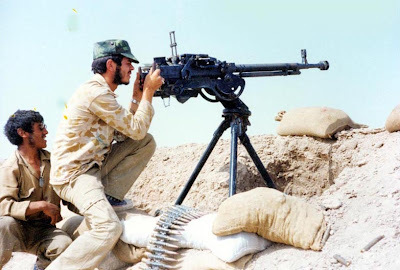 Like its U.S. equivalent, the M2 Browning, the DShK 1938 was used in several roles. 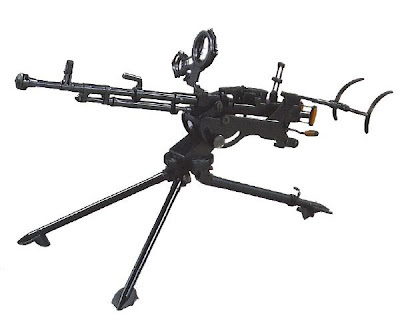 As an anti-aircraft weapon it was mounted on pintle and tripod mounts, and on a triple mount on the GAZ-AA truck. Late in the war, it was mounted on the cupolas of IS-2 tanks and ISU-152 self-propelled guns. 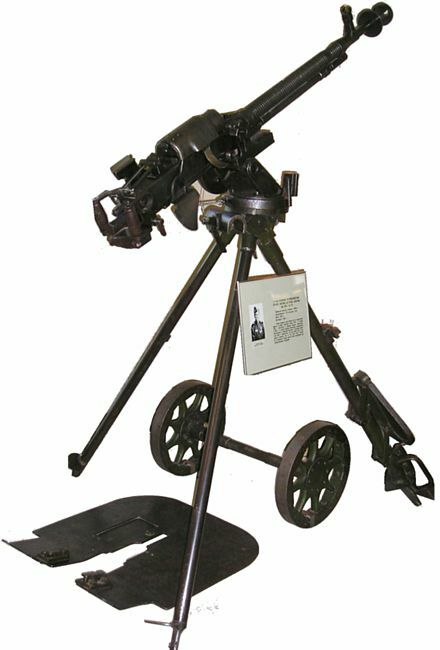 As an infantry heavy support weapon it used a two-wheeled trolley, similar to that developed by Sokolov for the 1910 Maxim gun. 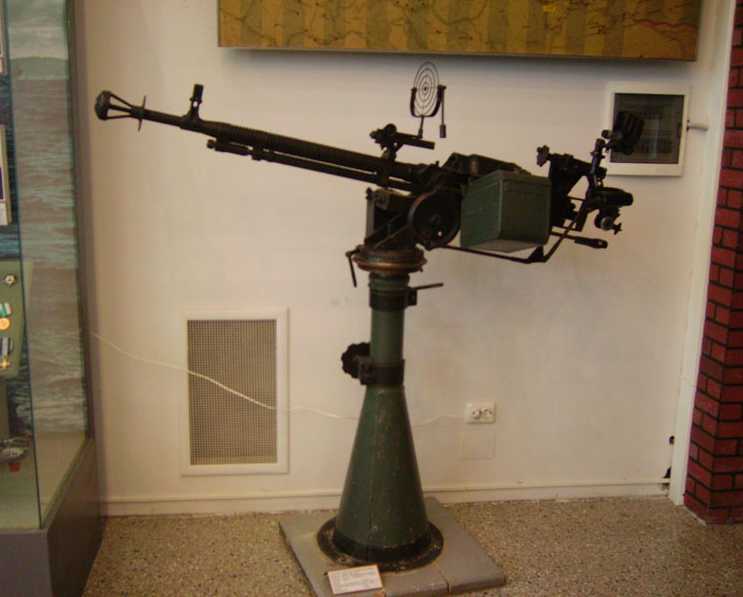 It was also mounted in vehicle turrets, for example, in the T-40 light amphibious tank. 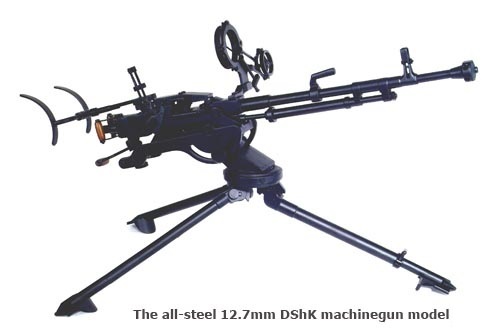 In addition to the Soviet Union and Russia, the DShK has been manufactured under license by a number of countries, including the People's Republic of China, Pakistan and Romania. Today, it has been partially replaced in favour of the more modern NSV and Kord designs. 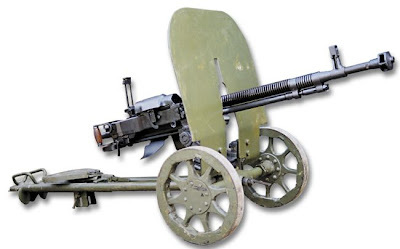 Nevertheless, the DShK is still one of the most widely used heavy machine guns in the Russian military.